I know that you’re thinking “how is it even possible when our whole lives revolve around our Smartphone?!”. You may also think that it’s impossible to quit your Smartphone. However, if you think about it, for most of human history, people didn’t have smartphones, and they didn’t need them. Our ancestors had tools, and that’s what our phone is – a tool. It’s egoistic to believe that we are in some way special or more important than our fellow flora and fauna. These biological machines (including us) are meant to be out in the open. We are meant to feel the wind against our hair and scrape our knees every now and then. Your Smartphone is keeping you from it. Let’s face it, would you rather start a new series or go for a run? To quit our Smartphone is to live healthily. Scientists have proven that the screens have become an addiction. In fact, even developing countries like India have de-addiction centres. The reason we are having a hard time accepting it is because this isn’t like any other addiction where a person uses an illegal substance. If you think about it, the millennial aren’t living healthy lives. They are cooped up inside their houses NOT learning any of the necessary skills that helped their parents attain success. Let’s use our phones as a tool and begin to live a healthy life again! I know it’s laughable to claim that we have poor human interaction, especially because I could video call anybody anywhere in the world from the comfort of my chair. However upon close examination, you’ll realise that we don’t talk anymore, we don’t talk about how we really feel. Most conversations begin with “sup?” and end with “nm”. Are these really the bonds that we will cherish for the rest of our lives? Alternatively, we could quit our smartphone and only use them as a tool to make life smoother! Another new epidemic – Millennials are zombies that need Wi-Fi to survive. Social media is mainly about creating an image of oneself so that we can gain social acceptance from people. It is paradoxical in the sense that the people themselves are trying to maintain their superficial life. It’s a vicious circle. How is this healthy living? The final argument is that our phones were invented to be tools. They were ironically built to help us live a healthier and more comfortable life. So in conclusion Smartphones aren’t bad at all, they are just tools, and like any other tool they will either help us or harm us, depending on how we use them. Let’s quit our Smartphone or at least minimise our usage of them. Let’s know they joy of being human, of being flawed. After all, this isn’t what our Father in heaven would want for us. Let’s start a new trend, a counter-revolution – let’s change the world (again) simply by listening to each other. Top 3 Celebrity Cruise Ships You Must Sail With! Looking to get a taste of the good lives of the rich and famous on your next vacay? 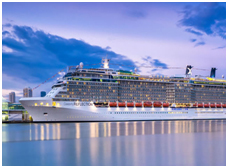 Well, get a whole chunk of it amidst the oceans on these celebrity cruise ships! 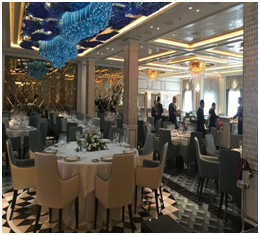 From the fleet of Regent Seven Seas, they claim this £297 million 750 passenger ship is “the most luxurious cruise ship on the planet”! Enjoy services like sunglasses cleaning by the poolside, being massaged with sea salts from the Atlantic Ocean and have someone carry your buffet plates for you. 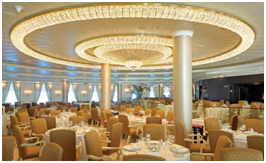 This cruise sails from ports in Italy, Portugal, Monaco, Greece to the French Riviera, Turkey, Egypt, Cyprus and Israel. Obviously! Every single room is a “suite” with the smallest being 219 square feet. 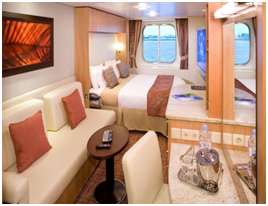 Every cabin boasts of a 138 square feet balcony with 10 feet depth. While stone and marble bathrooms, rainfall showers, European sleep slumber beds and high-end linen are basic amenities, Regent Suite, the most expensive one at USD 5000 per person per night is a staggering 2,917 square feet with two bedrooms, two bathrooms, separate living room and a 958-square-foot wrap around balcony. USD 90000 Savoir Bed, USD 250000 Steinway piano, a couple of Picasso paintings, personal butler and driver and an in suite spa are add-ons. Talk about fine dining! With every guest entitled to one dinner at every restaurant, you are sure to be spoilt for choice! 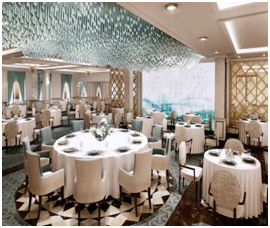 Titillate your taste buds at the continental flagship restaurant Compass Rose, dig into sumptuous dim sums, miso glazed black cod and curried seafood laksa at Pacific Rim or pamper your palate at the French Chartreuse. Still not satisfied? Head for their gourmet tours that combine wine tasting with meals prepared by Michelin starred chefs like Rene Berard. Or, why not try your hand at whipping up something delicious at Culinary Arts Kitchen, where you are trained in their professional kitchen. Ranked the best amongst the best of celebrity cruise ships like Celebrity Infinity, Celebrity Millennium, Celebrity Solstice, Celebrity Eclipse, Celebrity Silhouette, Celebrity Constellation as per celebrity cruise ships reviews by US News & World Report based on expert, guest and health ratings, this 3030 passengers luxurious beast was launched in 2012. 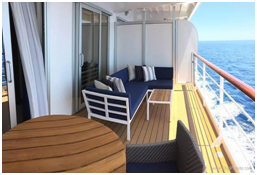 This luxury cruise sets off from Fort Lauderdale to St Lucia, Barbados and Antigua and from Rome to Mykonos, Athens, and Naples. 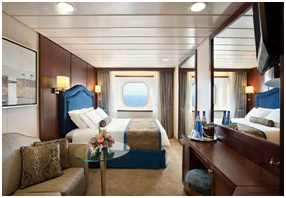 The staterooms on all the decks on board are 176-183 sq ft with two beds that can convert to one and come with pure Egyptian cotton linen, European pillows, luxurious pillow shams and thermostat controlled air conditioning. The Veranda rooms that are 192-575 sq ft with a 53 sq ft balcony also include all of that plus a sitting room, ceiling to floor sliding French windows that open to a private verandah, private bar and much more. 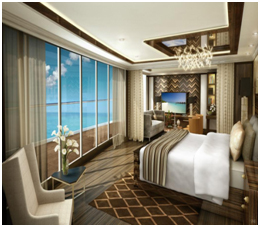 The class category rooms are 192 sq ft with 53 sq ft balcony and include all the above amenities; bathrooms with Hansgrohe showerheads, priority check in, baggage delivery, embarkation/disembarkation, welcome champagne, daily fresh fruits and flowers, personalized stationery and tote bags. Also, enjoy VIP invitations to events, hors d’oeuvres bottled water, selection of teas/juices, exclusive wellness treatments, and a shoeshine service. The suites are 300 sq ft with a 77 sq ft balcony and include all the facilities of the class category plus 24×7 butler service, private portrait sitting, in suite spa therapies, automatic doors to enter the bathroom and vanity roll in shower. Oceanview Cafe, Mast Grill or Aquaspa Cafe for your share of junky burgers, fries, pizzas, healthy eggs, granolas, salads and spicy tandooris, seafood, pasta or stir-fried veggies, there’s something for everyone! 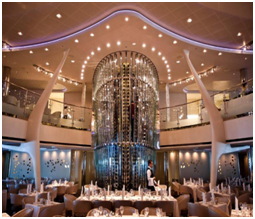 This upper-premium-line celebrity cruise ship is your answer if you are looking to spoil yourself silly. 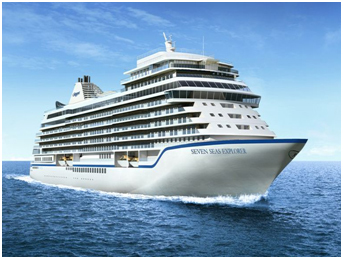 Oceania Riviera departs from Rome, Barcelona and Venice in summers with transatlantic crossings. 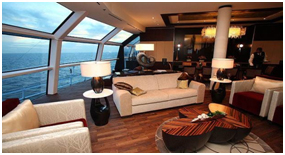 Apart from 478 staterooms, there are 147 suites. The best of them is the 2000 square foot Owner’s Suites with Ralph Lauren furnishings throughout. Add to those priority check-ins, luggage delivery, restaurant reservations, 27×7 butler service, unlimited access to the private spa terrace and you will literally be living in the lap of luxury! 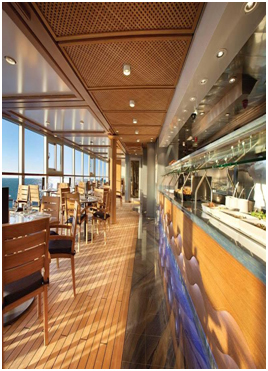 You’ll wish you had a bigger appetite to do justice to the diverse dining options on this celebrity cruise ship! Apart from the Grand Dining Room, there is a French bistro, Jacques, with a menu designed by Jacques Pepin; a steakhouse, Polo Grill, that serves dry aged beef; Toscana, the Italian fine dine where tables are designed with made to order Versace china and Red Ginger serving the best of Asia on your platter. That’s not all. Every evening, 24 guests can enjoy an exclusive seven-course meal at La Reserve by “Wine Spectator” at an additional fee starting at USD 95 per person or a table can be reserved at Privee for up to 10 guests at USD 250 per person. Brush up on your cooking skills at the Culinary Center, the well-equipped cooking school with individual cooking stations. 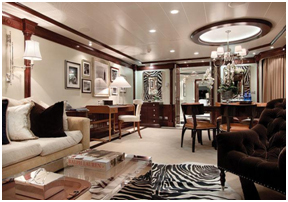 So, pack your bags and dip into luxury on your next sea voyage! Bon Voyage! 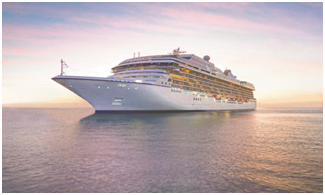 LSI keywords – Celebrity cruise ships reviews, Celebrity Infinity, Celebrity Millennium,Celebrity Solstice,Celebrity Eclipse,Celebrity Silhouette, Celebrity Constellation. Author gaiaPosted on February 15, 2018 February 15, 2018 Categories Portfolio, Rank Princess, SEO, Blog Posts, Industry, Lifestyle, TourismLeave a comment on Top 3 Celebrity Cruise Ships You Must Sail With! For coffee lovers, coffee is the most important meal of the day. They believe that it gives them superpowers. A cup of coffee gives them an unrealistic expectation of an increase in their productivity. Any coffee connoisseur can distinguish between hot brewed coffee and cold coffee. An interesting fact is that more than 90% of coffee productionhappens in developing countries like South America. Most coffee consumption happens mainly in the industrialised economies. Well, that explains why it’s the favourite beverage of the world! The real difference between the two lies in its aroma and flavour. The former is strong and acidic while the latter is cool and refreshing. Although they have the same initial ingredients – coffee grounds and water, they differ widely in preparation and taste. Hot coffee is typically prepared by letting hot water drip over a coffee filter either by using traditional coffee pots or modern coffee making machines. They are caught straight into a cup. It is as simple as that. Hot coffee is relatively quick to make and has a strong aroma. Cold brew coffee is made by soaking coffee grounds at room temperature or cold water and then let it sit, for hours or even days. Then they strain the resulting coffee from the mushy solids. It is not possible to endorse one type of coffee over the other as it depends on the consumer. It is ultimately decided by the coffee enthusiast’s palate and the weather on any given day. If one wishes for less acidic, subtle taste than traditional coffee, cold coffee is his best bet. If he craves for a strong, aromatic flavour, the hot brew is perfect. Cold brew has a creamier taste to it. Its cool refreshing flavour makes it a perfect beverage for a hot sunny day. Hot brew coffee gives you the energy to pump you up on a lethargic day. Cold brew coffee must not be mistaken for iced coffee. Iced coffee is made by brewing hot coffee and immediately adding ice. Cold brew demands more patience than the hot brew during preparation. Cold brew stays fresh for a longer time. Hot coffee usually has to be consumed within a day as otherwise, it becomes stale. Since cold brewing doesn’t volatilize the solubles, it has a blunt smell compared to hot drip coffee. For people who wish for an aromatic coffee experience, hot coffee is the better option. Now that you know the chemistry of hot and cold brew coffee, you will appreciate it the next time you grab a cup of hot steaming java or deliciously rich and soothing cold coffee. Whether you are a conservative hot coffee fan or a contemporary cold coffee addict, as long as there is caffeine in your cup, the right chemistry clicks between your soul and your cup of coffee and then everything is just perfect. Coffee is universally one of the most loved beverages. For most of us, our mornings begin with a cup of steaming hot coffee that stimulates every inch of our being. No wonder it is loved by all, with over 2.2 billion cups consumed worldwide every day! Around 90% of the coffee in the world is produced in developing countries. South America, especially Brazil is the leading coffee producer. India follows closely. A variety of caffeine options is served nowadays, keeping your passion for coffee in mind. Coffee blends are customised to satisfy your taste and budget. Cafes have started exploring new renditions of coffee by diversifying their menus. Freshly-roasted, handpicked, aromatic coffee from Karnataka and Andhra Pradesh, help make some great blends! You have some amazing choices between two caffeine beverages – cold brewed coffees, and hot brewed coffees. The two beverages are brewed keeping in mind their distinct taste profiles. Cold Brews Have Some Great Specialities! Try Out The Best Of Hot Brews- Especially The South Indian Filter Coffee! Although both coffee blends use the same base materials, their tastes differ wildly. Among the finest hot brewed blends, you must try out the South Indian filter coffee. These are chicory blended. A strong, dense and creamy offering! Hot brewed coffees have a brilliant aroma as well. When the ingredients of coffee are mixed with water, solubles from them dilute in the liquid. This gives the resulting blend a unique flavour and aroma. Coffee best dissolves at a temperature between 195 and 205 degrees Fahrenheit. Hence, hot coffee has a stronger flavour than iced coffee. When brewed with hot water, the solubles are quickly extracted from the coffee ingredients. They easily evaporate and release a beautiful aroma. However, the hot water might cause the coffee compounds to oxidise. This generates a bitter taste. If you are not a fan of a strong taste, iced brews are perfect for you. Oxidation happens in iced brewed caffeine as well, but very slowly. It does not turn acidic or bitter easily. It tastes more refreshing and stays fresh for a longer time. The Perfect Brewing Methods Ensure The Best Flavours, Aroma And Charm! The two key elements determining the charm, flavour, and aroma of coffees- both cold and hot brews are – temperature and time. Appropriate brewing methods are implemented to bring out the best in cold brews and hot coffees. The chemistry of different brews impacts the taste and feel of the beverage. Keeping this chemistry in mind, coffees are tailor-made to suit customers’ unique tastes. Some of the best and freshest cold brews are served in cafes and restaurants all over. These iced coffees are available in bottles and on taps. The best coffee shops seek to provide quality beverages with indigenous ingredients which add soul to your cup. Discover the realm of infinite possibilities that coffee has to offer and nurture the chemistry of love and longing that coffee shares with your soul. What could be better than a hot cup of freshly brewed coffee for kick-starting your day? The magical aroma and the taste tickle your senses and give you the energy boost you need to start yet another glorious day. Most people wake up and look forward to ‘smell the coffee’ and sip it after a restful night’s sleep. Next time your boss is on your head or wife is after your life; go for a cuppa coffee – hot or cold! The first thing in the morning that people around the world crave for is coffee; the first thing they ask for in the middle of a hot summer day is a glass of cold coffee brew. Hot coffee drinkers: This is your normal coffee with which you start your day. Most people prefer the regular hot coffee rather than the cold coffee. This is especially true for the first cup in the morning. The warm and nerve – soothing taste cannot be replaced by a cold coffee. Cold Coffee drinkers: A specially blended coffee normally served in cafes, restaurants, clubs houses and other places where you can order a glass-full. It may be served in different forms or with many different add-ons, like ice – creams. Cafe Latte: A lighter coffee mixed with a shot of Espresso with milk added. Cafe Frappe: The original cold coffee which is rich and creamy and has an endearing taste. It is an all-time favourite beverage of all coffee drinkers. Almond Rabri Frappe: This is a concoction of rich rabri with a shot of smooth, whipped cream and topped with roasted almond flakes. Experts, who know their coffee, source only the best coffee beans from Coorg and Chikmagalur in Karnataka state. It is also sourced from Araku Valley in Andhra Pradesh. This area is a non-traditional coffee growing region. Here, the local tribals have taken to producing coffee of a premium quality that is free from pesticides, thereby offering pure coffee beans that have a personality of its own. Years of research has revealed that coffee is not only a pick-me-up drink but it has therapeutic values too. Coffee is not only a versatile beverage- it is also a health drink that will add years to your life. So, here’s to Coffee – Cheers! LSI Keywords: coffee, Citrus Cold Brew Coffee, Almond Rabdi Frappe, Cafe Frappe, Cold Coffee, Cold Brewed Coffee, Regular Filter Coffee, hot coffee, brewed coffee. In this article, we’ll be walking you through some of the traditional Kannada elements to incorporate into your home. So be ready to de-clutter and renovate your home the Kannada way! Any Kannada household is bound to have a traditional hand- made rangoli design by default. The white coloured pattern made of rice flour made in different designs is found in every South Indian family since it is considered auspicious. It may take time and practice before you perfect it but it’s worth it! The interior designers of today are greatly inspired by this particular practice. A Kannada household always has a large broad mouthed vessel filled with water and fresh flowers floating on it. It brings a new feel to the house and is one of the best ways to perk you up instantly! These are window shaped outlines either carved in wood or can be seen embedded in the walls of a typical Kannada home. These can also be made of clay. When embedded in the wall, these act as a space to keep the earthen lamps or diyas. One can invariably find a typical Kannada household smelling of sandalwood! So you can use sandalwood incense sticks as well, or you can opt for scented candles instead. It can serve the dual purpose of lighting up a corner also. Yes! The indispensable accessory of festivals, even the grih-pravesh, designer torans that we usually purchase to decorate our homes is inspired from here. Traditionally these are made from fresh mango or coconut leaves, but you can also go for the fabric ones. This style statement of today has its origins from the south, where almost every courtyard has this particular piece of furniture. It’s available in every size right from those meant for toddlers to those intended for adults. So go on and add a bit of ‘ethnic’ to your balcony! A typical Kannada household is synonymous with a central ‘aangan’ or inner courtyard. A place that provides a special patch of sunshine to dry papads and make pickles! The outer verandah is invariably made of delicately carved wooden columns supporting massive wooden beams. These columns are seen crafted in unusual patterns and intricate designs. Oil paintings of gods and goddesses such as those of goddess Lakshmi find a home in these households. One can even find a corner dedicated to the ancestors where photos in black and white are kept framed. Ornate carvings in wood depicting mythological stories add a rustic element to the house. You can also indulge in these decorative pieces to add that rustic look to your home. Furniture may include wooden chests, decorative boxes in sandalwood, metal, marble, footstools, jharokhas and even bird cages. It is heavy in design with intricate patterns and motifs, curved armrests, metal or ivory inlay works and may have silk fabric upholstery. Whatever be the taste in furniture, you won’t find the knick-knacks and curios. No clutter in short! No household incorporates calm, serene and peaceful at one place as does a typical Kannada home. Just follow the cues mentioned above and bring these traits to your home.